Chess automatons are machines that play or appear to play chess. The first chess Automaton was called the Turk. In was constructed and unveiled in 1769 by the Hungarian nobleman Baron Wolfgang von Kempelen (1734-1804). He built a maple wood cabinet mounted on wheels. Behind it was a mannequin dressed in cloak and turban. He called the mannequin "the Turk." It was also known as the Great Chess Automaton, the Mechanical Turk, or the Automaton Chess Player. The Turk was considered the most famous illusion in history. Kempelen built the Turk to impress the Empress Maria Theresa of Austria (1717-1780) with a mechanical device that would be far more surprising and unaccountable than anything she had ever witnessed before. Kempelen built the Turk in 6 months. In 1770 the Turk was exhibited at Schonbrunn Palace in Vienna at the court of Marie Theresa, the Empress of Austria. 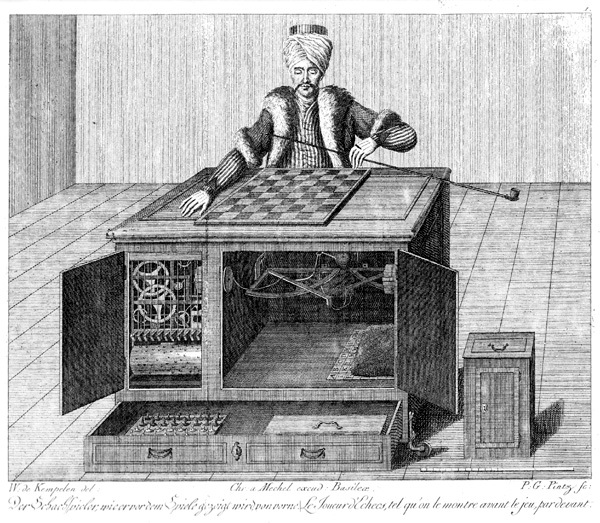 The illusion took the form of a man in Turkish costume seated at a desk with a chess board in front of him. Doors and panels were opened up to show no one was concealed in the desk. Inside were mechanical wheels and pulleys that made it look like the inside of a clock. The Turk was then wound up and set in operation to play chess or perform the knight's tour. Against all comers, it would play chess with its left hand and win 99% of the time. The first person to play the Turk was Count Johann Ludwig Joseph Graf von Cobenzl (1753-1809), an Austrian courtier and diplomat. He lost in less than 30 minutes. The Turk played several other opponents that day and won all its games. After the exhibition, Kempelen disassembled and retired the automaton to work on other projects. In 1781, Emperor Joseph II (1741-1790) ordered Kempelen to reconstruct the Turk and display it in Vienna during a state visit from the Grand Duke Paul of Russia. Kempelen restored the Turk in 5 weeks and had it ready for the state visit. After the exhibition with the emperor, Kempelen was urged to put the Turk on public exhibition throughout Germany. In 1783, the Turk went on tour all across Europe over many years. The Turk toured throughout Europe, shown to thousands of people. It was exhibited to large crowds in Paris and London. Many spectators believed that an evil spirit possessed the machine. In May 1783, the Turk played at the famous Cafe de la Regence and beat most of the skilled players there. Finally, Francois-Andre Danican Philidor, considered the strongest chess player in the world at the time, played and beat the Turk. Philidor went on to say that the game he played against the Turk was the most fatiguing game he had ever played. The Turk's final game in Paris was against Benjamin Franklin. Franklin lost, but reported that he enjoyed the game. Franklin was interested in the Turk for the rest of his life and kept up with any news of the Turk. In 1784, the Turk was exhibited in London. Opponents could play against it for 5 shillings. The Turk stayed in London for a year. In 1785, the Turk went on tour in Leipzig, Dresden, Amsterdam and various other cities. After the tour, Kempelen put the Turk in storage and tried to sell it in the early 1800s for 20,000 francs. In 1804, von Kempelen died and his son took possession of the Turk. In 1805, Johann Nepomuk Maelzel (1772-1838), a Bavarian musician, bought the Turk from Kempelen's son for 10,000 francs. Maelzel, the inventor of the metronome, added a voice box to the automaton so that it could say check (echec in French) during a game. In July 1809, the Turk (Johann Baptist Allgaier) defeated Napoleon Bonaparte (1769-1821) at Schroenbrunn in Austria, during the Wagram campaign. Napoleon lost in 24 moves. In 1811, Maelzel went to Milan for a performance with Prince Eugene de Beauhamais (1781-1824), Napoleon's stepson. The Prince then bought the Turk for 30,000 francs. The prince bought the Turk simply to learn how it worked (hidden operator). Maelzel gave part of the money from the sale to Ludwig von Beethoven to compose music. In 1815, Maelzel went to Munich and bought back the Turk from de Beauharnais. Maelzel agreed to pay the prince from the profits of the Turk's tour. Maelzel stayed in Paris with the Turk from 1815 to 1818. He then moved to London in 1819 and took the Turk on a tour of the United Kingdom. The Turk's operator at the time was Jacques Francois Mouret (1787-1837), a French chess master. The Turk would first play some endgames in the afternoon with any opponent, which it always won. Challengers selected a position from the Turk's book of endgames. The Turk got the first move in whatever position was selected, which meant that it always had the winning chances. The Turk would then play full games in the evenings. The Turk always played White and had the first move. When giving check, the Turk moved its head. After a game, the Turk would perform a knight's tour. The Turk's games had to be one hour or less. The candle inside the Turk's chamber used up the oxygen, so the operator had about an hour's worth of oxygen when performing. The Prince agreed to be paid from the profits of the Turk, but he died in 1824. The prince's heirs sued Maelzel for the balance. Maelzel later fled to America with the Turk to escape debts and the lawsuit. Maelzel then traveled to Britain and displayed the Turk for 5 shillings. Maelzel returned to America in 1825 and exhibited the Turk in New York City in 1826. Maelzel then did exhibits in Boston and Philadelphia. The Turk became so popular in Philadelphia that the first chess club in America, the Franklin Chess Club, was formed in Philadelphia due to the Turk. By now, the Turk's operator was William Schlumberger of France. In 1827 in Baltimore, Charles Carroll (1737-1832), last surviving signer of the Declaration of Independence, played the Turk and won. Carroll was 89 years old at the time. In 1828, Maelzel returned to Europe with the Turk, but then returned back to America in 1829. In the 1830s, the Turk toured throughout the United States and Canada. In 1835, the Turk was on display in Richmond, Virginia and Edgar Allen Poe (1809-1849) saw it and took an interest in it. In April 1836, Poe wrote an article in the Southern Literary Magazine. The article, 'Maelzel's Chess-Player,' was an attempt to explain how the Turk operated. In 1837, Maelzel took the Turk to Cuba for an exhibition. A year later, William Schlumberger, the Turk operator, caught yellow fever and died in Cuba. In 1838, Maelzel also caught yellow fever and decided to return to America. On the way to New York, he died onboard the ship. He was buried at sea off Charleston, South Carolina. Upon the return of the ship to New York, The Turk fell into the hands of one of Maelzel's friends, John Ohl. He tried to sell the Turk at a public auction, but owing to low bidding, Ohl bought it himself for $400. In 1839, Dr. John Kearsley Mitchell, Edgar Allan Poe's personal physician, bought the Turk from Ohl, restored it, and then donated it to a Chinese Museum in Philadelphia, where it remained for 15 years, never to be used. The Turk ended up in the Chinese Museum of Charles Willson Peale in Philadelphia, where it remained, never to be used. On July 5, 1854, the Turk was destroyed in a fire. A fire was started at the National Theater in Philadelphia and spread to the Chinese Museum. In its 85 years, at least 15 chess experts and masters occupied the Turk. Over the years, some of the secret operators of the Turk included Johann Allgaier, Boncourt, Aaron Alexandre, William Lewis, Jacques Mouret, and William Schlumberger. In 1859, the great magician Jean Robert-Houdin wrote his memoirs and tried to explain how the Turk operated, even though he never saw the Turk in action. He thought an amputee operated the Turk. 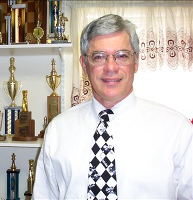 In 1984, John Gaughan, a manufacturer of equipment for magicians, started building a replica of the Turk. It was finished in 1989 and displayed at a magic conference. The human opponent was replaced by a chess program.